Computer secrets leaked via the... radio? Although Soviet computer technology had been developed behind the Iron Curtain, it kept up with the main stream of computing. Right from the start, information about computing developments came across the Iron Curtain from a number of channels, including espionage or purchasing and copying devices for demonstration. 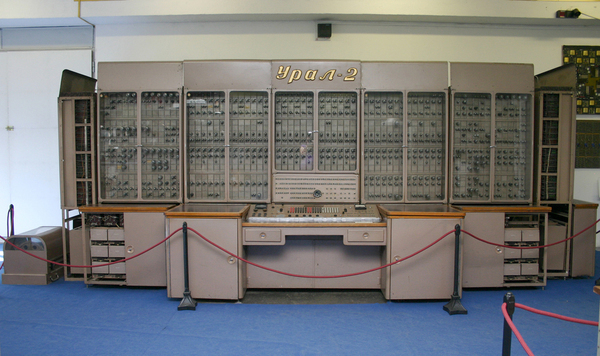 Even the first Soviet computer, "Strela" (Arrow), was only built after its constructor, Bashir Iskandarovich Rameyev, heard on the radio in 1947 that American scientists had developed ENIAC. Ironically, Ramayev heard this on a BBC broadcast, which was illegal in the Soviet Union at the time. In 1954, Rameyev was awarded the Stalin prize for his achievement, and he won a competition with another team to have the computer introduced into serial production. In total, Rameyev and his team built fourteen different models, including the famous URAL computer family. Trogemann, Georg, Alexander Yuryevich Nitussov andWolfgang Ernst. Computing in Russia: The History of Computer Devices and Information Revealed. Braunschweig: Vieweg, 2001. The exchange of knowledge and transfer of technology during the Cold War was not just a matter of controlling the flow of strategic technologies to the East. For Western democracies, it also involved security concerns, economics, scientific ambitions, and human limitations and desires.